Welcome to Holly Cottage. A small but perfectly formed 2 bedroomed listed cottage in the Heart of the Peak District. 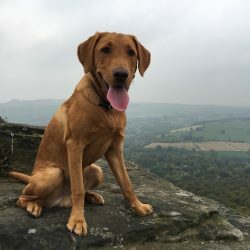 Many adventures await here which our resident Fox Red Labrador, Mac (short for Whisky Mac), can help you discover if you follow our blog. Please browse the website to find out more about the cottage and the Peak District. If you are interested in renting the cottage please fill out the form below or go to the Prices page. Well behaved dogs will, of course, be welcome. Please note I am only taking bookings up to July 2019. Thereafter I shall be moving there permanently. 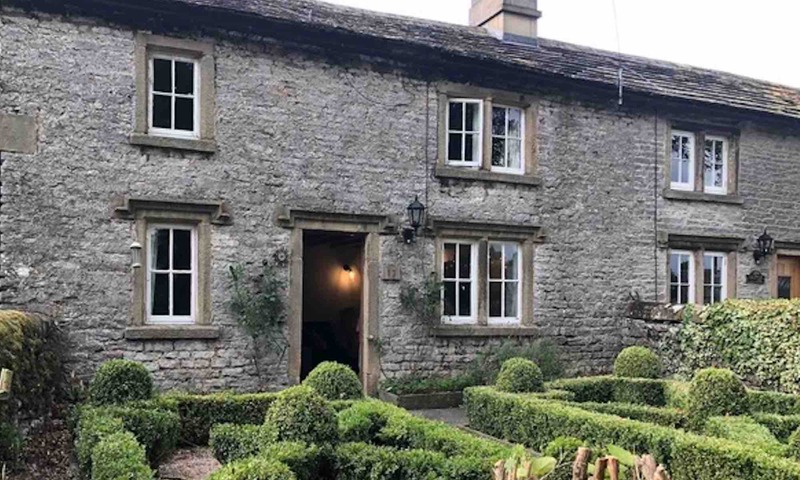 Holly Cottage is perfectly positioned in the Peak District for exploring all it has to offer. From the beautiful rolling hills and dales of the White Peaks in the South, to the rugged and dramatic moors of the Dark Peak in the North, you can easily travel by foot, bike or car from the cottage. Bakewell is a 10 minute drive, and has all the benefits of a small but bustling market town. The village of Youlgrave is 2 minutes drive for local shops and pubs. And, of course, the Dales are on your doorstep. The property itself is a pretty Grade II listed terraced cottage, with stone mullion windows. There are two bedrooms; one with a double bed, one with a bunk bed. There is a wood burner in the living room and an aga in the kitchen to keep the cottage cosy. There is a parterre garden in the front and a small open lawn at the back. I, my daughter Charlie and Mac spend as much time at Holly Cottage as possible when we are not working, at school or running races. It is our home more than a holiday let, and I will do everything I can to ensure your visit is as comfortable and enjoyable as possible. Follow us on Twitter and Instagram to learn more about this stunning area and follow Mac’s blog to see what adventures can be had in the Peak District. Please use the form below to get in contact and Kate will try to answer any questions you may have. The Peak District is a National Park right in the centre of England. It is bordered to the West by the M6, to the East by the M1 and with these and mainline rail links, the Peak District is easy to reach from all parts of the country. It was the first National Park, created in 1951 and more on the history of it’s creation can be found here. The Park is divided into two distinctly separate areas, giving a wide range of landscapes. The south is known as the White Peaks and is comprised of beautiful rolling hills and deep dales with limestone streams burbling through them. To the north are the Dark Peaks, with the hard gritstone edges and the stunning open moorland. Within this diverse landscape there are any number of activities you can participate in. From exhilarating outdoor activities such hiking, climbing, white water rafting and mountain biking to gentler pastimes such as exploring the great houses and museums. As a runner myself, the Open Access land, foothpaths and bridleways are a joy to explore. These of course suit anyone on foot, whatever speed they are going at. As I explore the Park myself I shall blog about the running I discover and share useful information such as maps. For hikers, I can recommend Walking the Peaks who are a friendly couple with a wealth of experience in the Peak District. If you are unsure where to go for a walk in the Peak District, have particular needs or interests, or you are experienced but simply need some new ideas on where to hike, James and Philippa’s personalised walk guides can help you get the best out of your hike. If cycling is your thing, Peak District MTB looks to have loads of great information for a cyclist from bike shops, repair and routes to events and projects you can get involved with. If climbing is your bag, the official Peak District government website is good for information on climbing and many other activities. All the Edges are very popular with climbers. Recently I took my daughter and a friend to Tittesworth Reservoir. This is a 30 minute drive away and is a lovely place to walk around. We hired some Stand Up Paddleboards (SUPs) from Tittlesworth Water Sports for an hour which was great fun and very refreshing on a hot day.